Money Concepts awards Darren Oglesby, RFC from Monroe LA as World Leader. In Recognition of a Worldwide Individual Record of Achievement in Personal Revenue throughout the Money Concepts International Network for the Year 2013. 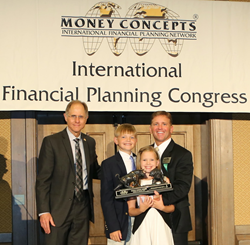 Money Concepts International celebrated their 35th Anniversary during their Financial Planning Congress. Darren Oglesby, RFC from Monroe, LA received the Worldwide Leader Award. Darren is President of Oglesby Financial Group and very active in his community with his family. In addition to his personal practice Darren has been guest speaker on debt management, retirement planning, investments and taxation nationally. Over the last 35 years, Money Concepts has established a collection of independently owned Best Practices to form turn-key solutions for advisors seeking independence without compromising the support needed to effectively serve their clients. President & CEO Denis Walsh commented " It is extremely exciting to see Darren grow. He has a passion for helping his clients and takes an active role in their lives".